This is a diet plan for people who like to eat and have a little drink. It should help you along the road as long as you stick to it. Please let me know what you think of it and how you get on. Ulster Television is supporting the UK-wide From The Heart campaign to raise awareness about organ donation and the N.H.S Organ Donor Register during Valentine’s week.In a special week of activity on air and online, U.T.V will highlight the shortage of available organs in Northern Ireland and across the UK. This is a sad case of a woman denied an abortion in Ireland, where their abortion laws are so out of date with human rights. The lady, Savita Halappanavar (31), a dentist, was seventeen weeks pregnant but had bad back pain so she went to hospital, were they found she was fully dilated and the waters broke, which meant the baby would not live. But the doctors said under the law they could do nothing as it was a Catholic country, they did nothing and she died. I got my new hearing aid after only four weeks, which i think was excellent service for the N.H.S. The doctor showed me how it works and how to fit it in. Then he set the hearing aid by computer with to programs, one for normal use and one for crowded rooms. A few British politicians are suggesting that the legal limit for abortions should be dropped from 24 weeks down to 12 weeks. Other politicians are asking that it be reduced down to 20 weeks which i think would be far better, as long as both have built in safe guards . I have always been blessed with good hearing, and as the saying goe’s ( i could hear the grass grow. ) But over this past two years i and others have noticed that i have started to ask them to repeat what they have just said. Or if I’m in a room with a lot of people i found it impossible to listen to one person speaking. Submitted by Dr. Mark MacDonald , San Francisco. 2… At the beginning of my shift I placed a stethoscope on an elderly and slightly deaf female patient’s anterior chest wall.’Big breaths,’. . . I instructed. ‘Yes, they used to be,’. . .replied the patient. 1. 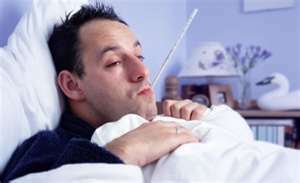 Man-Flu is more painful than childbirth. This is an irrefutable scientific fact*. Please click on the photo to enlarge it so that you are able to read it. Men, this is a guide just for you, to help you keep on the right side of your wife. The British National health has gone down in standards over many years, it started when the Labour party started to cut left, right and centre. They cut the amount of staff, the amount of wards and also the amount of money going to the hospitals, etc. In cutting the amount of wards, they had the bright idea of making some wards mixed, which i would find very awkward. The present Government has stopped mixed wards.